Home / What a knock out! Sometimes all the planets align and a canvas just knocks your socks off when it is finished. This is one of those times! 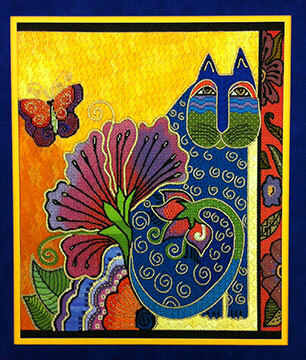 Mary stitched this piece with direction from Brenda Hart and it is exquisite! 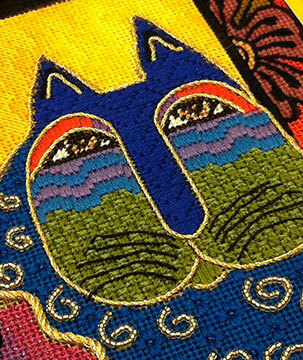 You really can’t go wrong with a Laurel Burch canvas as your starting point. Each is more beautiful than the next. 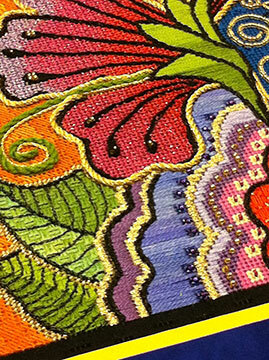 The stitches and threads selected are all perfect, adding just the right amount of detail to the canvas. The colors are bright and sunny. 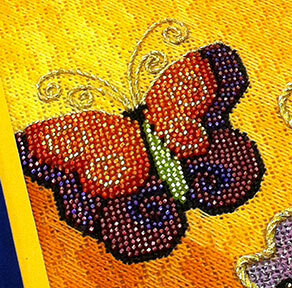 The butterfly is completely beaded; sparkle is never a bad thing. Add all these components to Mary’s beautiful stitching and magic happens. Thanks Mary, for letting me share this with everyone. It is even more spectacular in person. Just gorgeous. That is amazing! Great job, Mary.